When layers are kept in production for 100 weeks instead of 60 or 80 weeks, egg output and the associated export of nutrients is much higher. High performing birds need a perfect feeding strategy to maintain the desired performance levels. Certain factors should be taken into account when designing a perfect feeding strategy. Higher laying rates, better persistency and longer production cycles are observed over time. 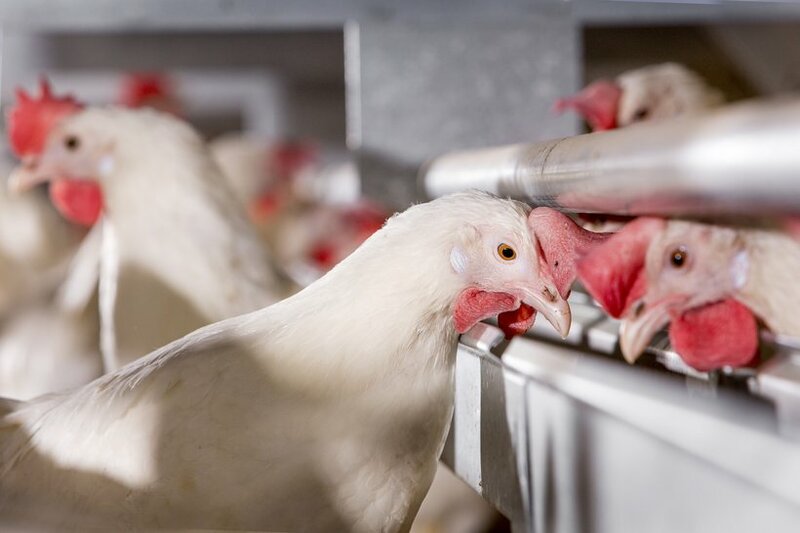 This trend will continue as breeding companies, egg producers, and animal feed companies collaborate more and more to maximize animal performance, feed efficiency and animal welfare. Genetic progress and longer production cycles have consequences for nutrition. This article looks at factors such as nutrient intake, amino acid requirement, and liver health. In addition, make sure you are familiar with the genetic potential of your birds and their breed specific nutritional requirements. The actual nutrient intake in gram nutrient per hen per day is a result of the diet composition (feed formulation) and the feed intake level (feed consumption). The actual nutrient intake should match the nutrient requirements in all stages of birds’ development: growth, growth combined with (start of) production, only production. Besides growth and/or production, nutrients are always needed for maintenance. Nutrient requirement is also influenced by production level of egg mass, which is a result of egg weight and deposition. In the period 18-35 weeks of age, birds are still growing and therefore need nutrients and energy for growth, next to their standard needs for maintenance. As birds also come into production in this period, nutrients and energy are needed for egg production as well. Unfortunately in the period of 18-25 weeks, feed intake capacity is still limited and might not cover the nutritional and energy requirement which results in a deficiency. Other factors which can lead to a deficiency is when daily feed intake is low due to high environmental temperatures. In these situations an additional midnight feeding can be offered to the birds in order to increase daily feed intake. If daily feed intake is to low, also check water intake level. Too strong restriction on water intake or water with flavor deviation due to pollution can result in lower feed intake, which can result in lower egg weights and finally lower egg mass produced. A situation of low feed intake resulting in a nutrient and energy deficiency at start of lay, can have an impact on the whole production cycle by, for example, lower production in terms of lower laying rate and egg weights, increased mortality, and reduced egg shell quality. Therefore always check nutrient requirements with actual feed intake level, because nutrient intake = diet composition x feed intake. Requirements for amino acids can be expressed in ideal amino acid profiles (defined as a percentage of lysine) or in mg amino acids per gram of egg produced. Actually, three different stages and corresponding ideal amino acid profiles can be distinguished: growth, growth combined with (start of) egg production, and egg production. Although all essential amino acids could be a limiting factor, lysine is the most commonly observed limiting factor for growth because development of muscle mass is at high level, while it is methionine during egg production. At the start of egg production, feed intake capacity is still limited and might not cover the nutritional requirements for amino acids which results in a deficiency. Therefore amino acid levels should be adjusted towards actual feed consumption observed and egg mass produced. Later on in the production cycle, requirements for e.g. digestible methionine reduce with approximately 12% from 60 weeks towards 90 weeks of age. However, birds within the same flock will differ in their production performance level and consequently show variety in their requirements for methionine. This stretches the approach that later on in the production cycle, after growth has been finished (approximately 30-35 weeks of age), amino acid levels should be determined based on daily egg mass produced (deposition and egg weight) and not on the age of the birds. Another important fact to take into account is that the ‘average laying rate in percentage’ does not match individual performances and it could be that two thirds of the flock performs above this average. If the average laying rate is used to estimate the daily amino acid requirements, this can lead to an underestimation of the actual requirements of most of the birds. Because of differences between birds in performance, nutritional requirements have to take into account flock uniformity by feeding and managing the weakest birds while allowing the best birds to produce at their genetic potential. This can be achieved by respecting a safety margin for the inclusion of digestible amino acids in a situation where uniformity is low. If levels of digestible amino acids are set above theoretical concentration (+5%) excellent results can be achieved. To conclude, provide enough amino acids (take daily egg mass and actual feed intake into account), keep flock uniformity in mind and provide amino acids above theoretical requirement for excellent results. The liver is considered to be the key organ for birds in a long production cycle when birds are producing eggs for 90-100 weeks. The reason for this is the influence of the liver and its health and functioning on egg weight, laying rate, persistency in lay, egg shell quality, mortality, and feed conversion. The older birds become the more egg mass they have produced and the more challenging it is for the liver to keep healthy. The main challenge is the omnipresent risk of developing a fatty liver, as predisposing factors are frequently present in current commercial egg production circumstances. Common predisposing factors seen in situations with production issues as a result of fatty livers are high temperatures, high energy intake, corn diets, fat birds, and cage housing systems. A fatty liver is in malfunction and birds will drop their production performance. Furthermore, liver health is linked to egg shell quality through the metabolism of vitamin D. Egg shell quality deteriorates when the liver is less efficient in activating vitamin D3 which is necessary for calcium transportation to the egg gland. Nutritional factors that are able to stimulate the recovery of the liver and also able to prevent issues with fatty livers are diets high in fat instead of high in carbohydrates and the inclusion of choline, vitamin B12, folic acid, and vitamin E. Choline is highly effective and present in a wide variety of raw materials, like in soybean meal and rapeseed meal, although availability of choline in rapeseed meal is low. Wheat and corn also contain choline and higher concentrations are seen in wheat compared to corn. Although choline is present in quite a variety of raw materials, supplementary choline is always beneficial for the birds in production and therefore must be included in layer diets. Several factors determine the amount of added choline which is needed. The main factors are raw material selection, length of production period, and the desired safety margins as part of risk management. Maintain hens’ capital throughout a longer production cycle by focusing on liver health and preventing the development of a fatty liver by providing energy from fat instead of energy from carbohydrates and by supplementation with sufficient amounts of choline.